This Pre-Registration speeds up your process on the morning of the car show. You go to the head of the line if you Pre-Register Online. Please spread the word to Pre-Register Online NOW. 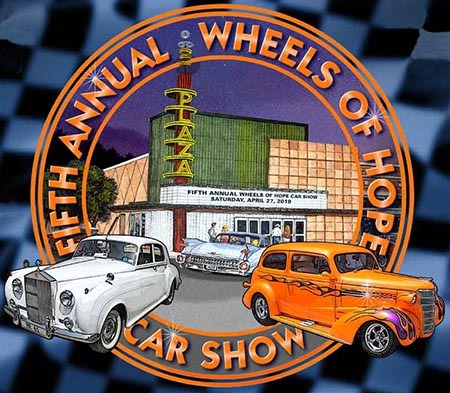 Register your car or truck for the 2019 Wheels of Hope Auto Show in Garland, Texas on Saturday, April 27th, 2019. Awards for each class will be begin at 2pm. Please note the important info listed below. Please click here to visit our wonderful 2019 Wheels of Hope Car Show Sponsors! Rain reschedule date: Saturday, May 25th, 2019. Please contact Jamie or Dana for any last minute questions. * Best of Class and Class Winner for each above category. Liability Waiver: By registering my car or truck I hereby agree to indemnify, save, and hold harmless, Wheels of Hope, its subsidiaries, agents, volunteers, sponsors, or any other persons or representatives from any and all liability arising out of or in any way relating to my participation in the Wheels of Hope Car Show on Saturday, April 27, 2019. We reserve the right to refuse admittance to any persons or vehicle which in our sole opinion is not in keeping with the quality or safety of the show. Registration is non-transferable and non-refundable.